Objects Of Affection: Wednesday Wish List - I'm Seeing Yellow! Yipee...I didn't forget my wish list this week! I thought that I would do a yellow list in honor of summer. 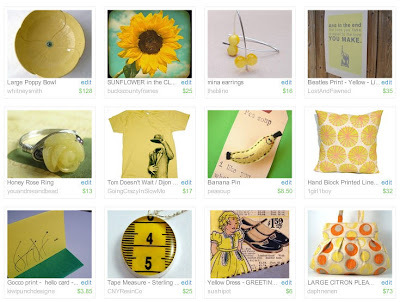 Yellow is one of my favorite colors, I have a yellow house (both inside and out), and my shop is painted yellow inside as well! Oh, and I forgot all of the beautiful endless wheat fields that are all around ready for harvest! Hey, I recognize those earrings! Thanks for the nod!